The finals of the 2018 Fargo Junior Greco-Roman Nationals gave you everything you could have hoped for. Crazy comebacks, tactical fighting, high-level technique, and frenetic exchanges. The annual tournament, lauded for its size and number of competitors, is always at its best when the championships are earned using more than one methodology — which is what we saw on Friday. 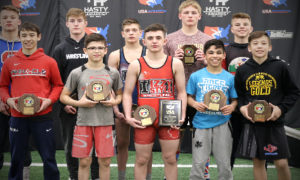 What it also shows is that more and more youth athletes are improving their respective Greco acumens, something coaches around the country have been working extremely hard to achieve as of late (in case you haven’t been paying attention). Tanefeu didn’t feel the need to waste too much time and briskly moved into Griffin to wrangle a deep arm drag. He tried to take that drag and spin around, but nothing was doing. They jabbed at one another, neither wrestler really committing to any one position. Eventually, Tanefeu was put down first in par terre and promptly gave up a gut to fall behind 3-0. In the second period, Tanefeu chipped a point back via passivity. From top, he went to gut but Griffin, who was bothered by his right knee seemingly all match long, defended. Down by a pair, Tanefeu had a good idea. He clambered into a lateral position and went to his hip to try leveraging Griffin over from the surface. The strategy didn’t work, although Griffin did not capitalize further. Tanefeu stayed on his horse as the clock wound down with Griffin holding fast the rest of the way to collect a 3-1 decision win and his first Junior National title. A big-time match-up if there ever was one. 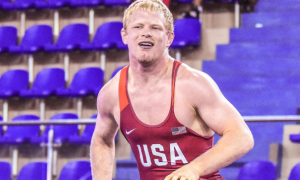 After all, it’s not everyday a Fargo freestyle champ/Greco-Roman collegiate commit and a Cadet World Teamer go head-to-head, so this one offered a little extra spice. A series of mini exchanges greeted both before Chaowanapibool unleashed a cascading arm throw. His follow-up transition attempt for more points didn’t go anywhere, and the World Teamer entered the break leading 4-0. King, shrewd as he is explosive, employed a quick arm drag he turned into a takedown. He accompanied Chaowanapibool to the mat close to a trap-arm gut but Chaowanapibool fought it off. Back on the feet and a duck attempt by Chaowanapibool fell short. King wanted to latch on a limb or around the body. But with under :30 to go, Chaowanapibool struck again on an arm, this time going to his hip and rolling all the way through for two and a 6-2 tally that put him out of reach. 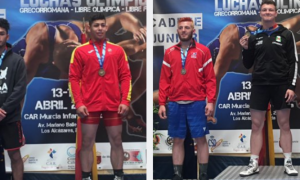 Cadet Pan Am Championships runner-up Creese holds a place as a very serious Greco prospect going forward with his counterpart on Friday also having made a name for himself. The 113-lbs final could have gone in a multitude of directions, though most of them included a Creese win if only due to the meaningful experience and overall ability the youth is recognized for. Creese was forced to defend a darting arm spin attempt by Rowland. After a reset, Rowland nailed two on a correct throw but Creese reversed and came pretty close on a lift. But his next go at it came through, giving the Minnesotan a 5-1 lead. Just before the buzzer Creese netted another two on a correct throw and followed up with consecutive guts to surge ahead 11-2. Needing points and a lot of them, Rowland zeroed in on the body to begin the second period. Creese kept his feet and the two athletes resumed clashing in the center. A caution-and-two on Creese closed the gap to 11-4. 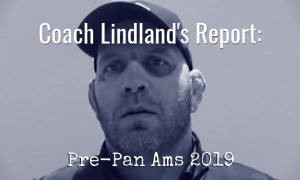 With :30 remaining, Rowland went deep on another arm spin only to have Creese turn it around for his own takedown, and eventually, a 13-4 decision victory. La Joie dug in to bring pressure for 2017 Junior World silver medalist Severado and did a fair job of pushing forward in the early going. The Michigan athlete was driving Severado towards the boundary and seemed to have come up with a two spot. But — Severado challenged, as he had made an last-second counter attempt. Upon review, the call was upheld and La Joie’s 2-0 lead expanded to 3-0. Soon into the second, Severado got the shot he was waiting for, collecting La Joie for a short throw that yielded four points. HOWEVER — almost immediately after the restart, Severado was hit for a two-point caution for finger-grabbing. But he composed himself in short order, spinning behind for a takedown and retaking the lead 6-5. Then, with just over a half-minute left, La Joie was credited with a four-point bodylock. Time was running out. La Joie clasped on another bodylock nearing the edge. Severado held an overhook and almost came over the top. The officials awarded two at the buzzer resulting in a Severado celebration. But La Joie’s corner threw in the cube — and won — giving their guy his first-ever Fargo National title by an 8-6 score. Sandoval busted out of the chute like a madman, picking up six points on a trio of front headlock rolls. The period unfolded with intensity, and Almauger, too good to just fade into the nether without putting up a serious fight, got on the board near the end of the first with a four-pointer. Before a minute had passed in the second, Sandoval used a lateral to set up a takedown, ballooning his advantage to 8-4. After the reset, Almauger collapsed inside for a look at the body and Sandoval deftly countered his way to another takedown. Sandoval was in control. Time was on his side. But following the restart, Almauger bombed a headlock. Right away, it was good for four, though the manuever’s implications were far greater. Almauger had Sandoval on his back with no escape in sight, and the signal for the pin arrived soon after. A stunning finish for Almauger, who never stopped trying to will his way into the match. NMU-bound Kanari and 2017 Cadet World Team member Lovett offered one of the afternoon’s most anticipated showdowns. Kanari got started right away by catching Lovett for two, but the tables turned quickly as Lovett picked up four off of a throw. When they reset, Lovett was there again, this time with a bodylock and four more, plus two on a correct hold following an attempt at the boundary. Down 10-2, Kanari had to get going. He came awfully close to jumping back in the argument when an attempt that led to Lovett rolling over his back unfolded late in the period, but no points were awarded. Kanari did what he could to make it a fight in the second. He controlled position throughout and tried working Lovett to open up. But nothing was doing and the wrestlers spent the majority of the three minutes trading tie-ups with Lovett walking away the 10-2 winner. Sihavong opened up a 1-0 edge on a hardway step-out point. Parco, observing a more conventional methodology in terms of positioning, wasn’t being active enough for the officials, and as such, he went down first in par terre with Sihavong taking advantage by rotating a gutwrench for a 4-0 lead he carried into the break. Parco received his passivity par terre chance halfway through the first minute of the second and deliver by nailing a picturesque Polish finish plus two caution points, thus racing out in front 7-4. Hungry for more, Parco grabbed two when he swooped behind for a takedown, that 7-4 lead climbing to 9-4 — and then following another caution on Sihavong — 11-4. Because there hadn’t been enough cautions thrown around already, Parco was penalized for one himself. Even still, he made it to the bell the 11-6 victor following a stormy second-period comeback that also resulted in his first Fargo triumph. Carlson bulldogged Rachal out of the gate, coercing an immediate step-out. He looked to chug, chug, chug, but Rachal broke free just long enough to race behind and bomb a belly-to-back for five. To his credit, Carlson was undaunted, and he ran Rachal to the boundary where he netted a takedown. A slugfest of points ensued. Rachal clamped a bodylock, twisting Carlson down. He then converted for more points by cranking over a gut. 9-5, Rachal. The second period was barely a minute old when Rachal locked around Carlson’s body. He thought he had it secure, thought he had the lane to thrust forward and down. As he made his move, Carlson adjusted and collapsed on top. There was no doubt, and what promised to be a raucous second period was all over, the match with it. Not unlike Almauger, Carlson pounced on the big opportunity in front of him and it resulted in a pin. There were several matches in the 2018 Fargo Junior Greco-Roman National finals that checked in as must-see, and Omania/Eischens was certainly one of them. Both athletes sport extensive age-group experience and both possess skill-sets that are among the elite in the country. Eischens drew first blood by slickly positioning himself around and then behind Omania for two. It may not have been much, but it set a pace that Omania knew he’d have to keep up with. Eischens was at it again, countering off of Omania and spinning behind before transitioning to a gut. Up 6-0, Eischens was in command, though Omania let his voice be heard just ahead of the break by crashing Eischens off the edge for a point. Early into the second, Omania turned it on in a major way. He darted behind and launched Eischens belly-to-back for five, the second such sequence in consecutive matches. After the reset, there was Omania. Similar to how Eischens was able to accumulate points in the first, the Californian angled behind to collect a pair at the boundary to the dismay of the Minnesota coaches who argued it was Omania who went off the line first. Later in the period, Omania lassoed around Eischens for another big toss. Eischens landed on top, but it was ruled a slip. The tempo was increasing. Eischens doggedly battled his way in the tie-ups, searching for points. He got one on a step-out and charged back for more. 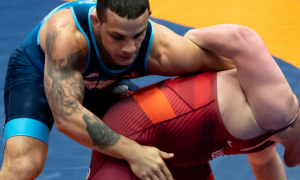 Omania held strong from then on as the first current US age-group Greco World Teamer to win a Fargo National championship in 2018. He’d be joined by another following the proceeding final. Washington, who enjoyed a whale of a tournament leading to Friday afternoon, came in heavy with an arm throw attempt that Dow stoically yanked back to collect four. Two more went in Dow’s direction near the edge, and it all looked academic — at first. Dow was composed, confident, and in control against the comparatively inexperienced Washington. Up 7-1 still in the first, Dow briefly gave up position — and a handful of points — as he attached himself to Washington’s arm for an apparent Hermann throw. Washington locked his hands and went with it, and was awarded with four plus one more from a Dow challenge that was denied. Dow came back with a correct throw to take a 9-6 lead but Washington answered right away with his own correct hold. What appeared like an eventual Dow runaway turned into a mere one-point lead for the Wisconsinite heading into the second. Dow added a step-out point as the two were jostling near the line. They were almost going move to move, constantly working to answer each other back. Washington with two; Dow with two. Washington locked for a throw that he didn’t have all the way secured and Dow landed on top. But instead of two, he was given four. Washington forced a step-out with time ticking away, but Dow was in the clear 16-12, which also represented the final score. Dow will now focus his attention on competing at the Junior World Championships in September. Cramer, he was an athlete most expected to have a shot to advance to today’s slate of finals. Foca? Not so much. And the New Jersey product didn’t have the easiest route available, either. 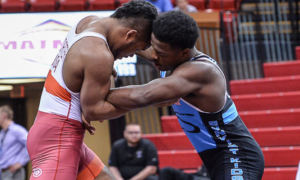 It was Foca’s grinding 7-5 decision over Vincent Baker (GA) that got him here, and he was determined to bring the same kind of fight to Cramer. He accomplished that directive, did Foca, but Cramer still reigned supreme when it was all said and done. Cramer received the first passivity par terre chance of the contest and took advantage by gutting Foca over for a 3-0 lead. Foca, not content to just stay there, scrambled to a front headlock and swept it over, netting two. In one impressive sequence, Cramer used a head-arm pinch and slid it bye for a takedown-gut combo, which translated to a 7-2 lead. If he was going to be in this match, Foca had to find a way to penetrate Cramer’s defenses. No easy task. Cramer diligently waded through his tie-ups and observed a brisk pace. Foca made a nice attempt as the second period wound down. He dropped levels as if to duck-under from a distance but then bullied forward towards Cramer, who tried to counter as Foca swept behind for a takedown. But that would be it for the New Jerseyan. Cramer stayed out of danger hustling to the end of what was a 9-4 decision finals victory for Illinois, their first of the proceedings. Three more joined Cramer before the day was through. State teammates or not, this was a battle many wanted to see, with Braunagel and Jessen delivering two of Illinois’ more noteworthy performances throughout the two-day event. 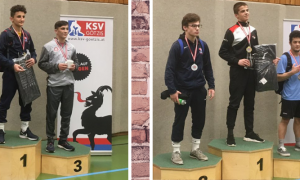 The bruising Braunagel, who defeated Tommy Brackett (TN) in the semis, benefitted from the first passive/par terre and capitalized appropriately, gutting Jessen over twice. It didn’t mean that Braunagel could throw it into cruise control. Towards the end of the first, Jessen snuffed out a Braunagel headlock attempt, collected two on a takedown, and raked a gutwrench to climb within a point. There was no further scoring in the second but it didn’t take away from the tension. Jessen was biting down and chipping in the tie-ups, doing whatever he could to loosen up Braunagel or find an angle. The points can come quickly. For his part, Braunagel remained disciplined in his stance. It’s one of his trademarks. He played back into position when he had to, and scanned openings to see what was available. Two evenly-matched competitors provided an evenly-matched result, but one that fell in Braunagel’s favor 5-4. Davison with an arm throw and a gut right away to go up 4-0. Escobedo wasn’t even warm yet. Davison kept position on top and arched back for four more and a lightning-fast 8-0 lead. He was moving Escobedo around, although the Californian did spring to life and wrangle his own attempt. But Davison, he was operating at a different speed. A step-out put him one point shy of a tech, and what’s more, he knew it. Escobedo flung the arm on a duck under. Davison gave it a look, bounded back up, and snared a front headlock that whipped Escobedo off the edge, and essentially, out of the match. A sparkling 13-0 tech fall win for Lucas Davison, who really caught a lot of folks’ attention this week. The second all-Illinois final provided fans with an opportunity to see 2018 Cadet World Team member Luffman take on one of his state’s most respected youth competitors in Punke. A scoring blitz, this wasn’t. What it did offer was a closer look at next-level in-match strategy and two athletes who go about their respective business with the same give-no-quarter attitude. Punke looped around on a bodylock that he patiently used to walk Luffman out, netting a point. This was the principal game plan apparently for Punke in the beginning stages, and it worked, because after the reset he repeated the pattern. Punke got around Luffman, clasped, and escorted him to the line. 2-0 Punke on two step-outs. Punke charged forward with another bodylock soon into the second, but this time Luffman was waiting and ole’d him out. 2-1, Punke. But then the reset and here it was again — Punke with a bodylock to a hardway step-out, and another right after for two points since Luffman went to his knees. 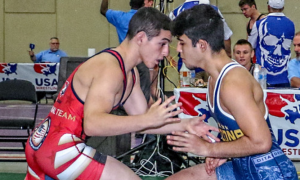 The 2018 Cadet World Teamer responded with a takedown to close the gap to 5-3 and the race was on. Luffman poured inside, crashing in with a couple of last-gasp attempts. Punke kept steady on his feet and fended off the charges, earning his first Junior National title in the process. Cassioppi, firmly established as one of the country’s top heavyweights (if not #2 overall), prevailed at Fargo in 2017 in the most nail-biting, adrenalizing way possible. Regardless of who he was going to be meeting up with Friday afternoon, the ultra-competitive athlete was likely looking forward to another heartstopping brawl, even if going by his dominant march to the final, the prospect of such seemed to offer slim odds. Austin Emerson is a stout talent who one will likely experience the kind of success normally reserved for big men with big work ethics, but he was never able to plant his foot on the pedal against Cassioppi. As soon as the official awarded the Illinois wrestler with a passivity point, it was as good as over. Cassioppi locked a gutwrench and that was that, as he rolled Emerson five times for a startlingly-quick 11-0 tech, good for his second straight Fargo crown. Illinois led the charge with ten finalists. California was second with four and Minnesota was third with three finalists. 11 of the 15 finals bouts were decided by points. There were two tech falls and two pins. Six athletes who competed in a World Championships event or will be this year advanced to the Junior finals. They are: Chaowanapibool, Severado, Lovett, Omania, Dow, and Luffman.